The English version of point de collection launched today. 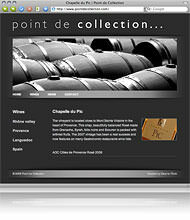 point de collection… provide an exclusive range of quality wines from France and Spain. They also have the ability, through the CMS, to include French content, which will be added in the next couple of months – we’ll keep you updated with future site developments. Dare to Think were recommended by La Ferme du Mont, who were recommended by VertuVin. It just goes to show the importance of contacts and creating and maintaining a strong client relationship. Hopefully, we’ll visit the Vineyards soon and celebrate in style! We seem to be launching sites on a daily basis at the moment! 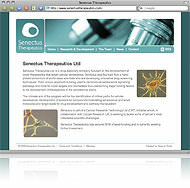 Senectus Therapeutics is the next one to launch today. They are a drug discovery company are are part of a Cancer Research Technology initiative. They required a website that was easy for them to update so they could add the very latest news throughout the year. Users are also able to keep up to date with latest developments through an RSS feed and email updates. In our continuing relationship with zoofish.co.uk we were asked to create some sites they’ve designed. 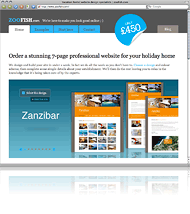 zoofish.co.uk offer a website design service for vacation rental owners. The owners get to choose a design style and a colour theme for that design all for a set price. The designs are really fantastic and it would make any holiday home look great and make you want to visit. Dare to Think were asked to put together the backend for not only the new zoofish.co.uk site but also each style and colour theme they have to offer. We’ll be continuing to work with them to add even more styles to what they can offer. Today saw the launch of LaFermeDuMont.com. 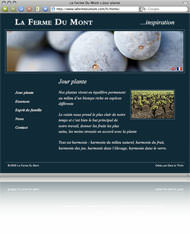 La Ferme du Mont is a wine producer based in France. Dare to Think were recommended to them by one of our current clients, VertuVin. We love getting this kind of work, through word of mouth, as it goes to show that our clients are happy with the service they receive and the work we produce. Dare to Think were asked to produce a simple, classic website that reflected their current identity. Along with this was the requirement of a multilingual site, in French and English, and the ability for the client to maintain their site with News additions and site amends. Continuing our relationship with VertuVin Wine Producers, we’ve been busy working with Stephen on updating their website to freshen up the site and add further functionality. The main focus was the wines section which now includes technical descriptions downloads, clear labelling of the wines and regions as well as fancy pop-ups of the wine bottles. All useful information when selling their services to producers, wine buyers, importers and distributors. We’re continuing to work with VertuVin on a regular basis to help them create their perfect business.